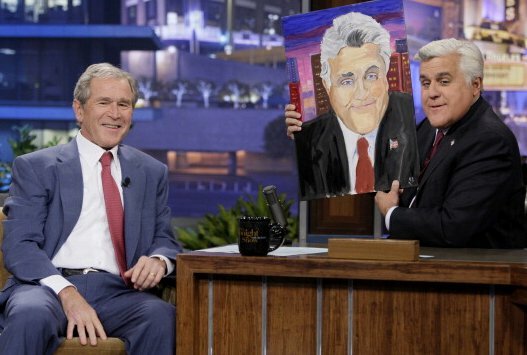 George W. Bush revealed his painting hobby, talked about his granddaughter and poked fun at his post-White House years on The Tonight Show with Jay Leno last night. The former president said that he was inspired to take up painting after reading a Winston Churchill essay. George W. Bush, 67, shared paintings of his dog Barney and a stray cat that he adopted and named Bob said painting has changed his life. When asked what caused a blocked artery that led to his hospitalization in August, George W. Bush joked that it was because he “didn’t behave that well when I was younger and I might have smoked some”. George W. Bush has kept a mostly low profile since exiting office in early 2009 while the country was in two wars and struggling with an economic crisis. “It’s hard for some to believe, but I think eight years in the spotlight’s enough,” he said. Former First Lady Laura Bush also appeared on Jay Leno’s show to discuss the couple’s charitable causes. They also showed the strand of pearls George W. Bush gave her for their 36th wedding anniversary and a video clip of their first grandchild, nicknamed Mila.